Accepted Scientific Name: Leuchtenbergia principis Hook. SB566 (Collector: Steven Brack) Locality: Hipolito, Coahuila, Mexico. It has a strong underground napiform root and in time forms an almost caudiciform trunk. 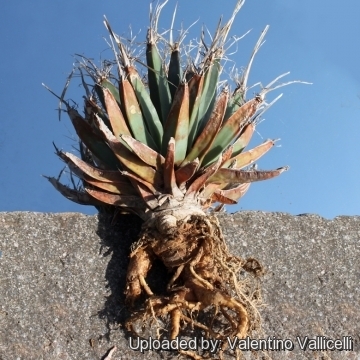 It doesn't look like a cactus at all, the tubercles are 10-13 cm long and look like triangular agave-like leaves; Hence the common name "Agave Cactus"
Origin and Habitat: North-central Mexic, where it occurs throughout much of the semi desert in the states of Coahuila, Durango, Nuevo León, San Luis Potosí, Tamaulipas, and Zacatecas. 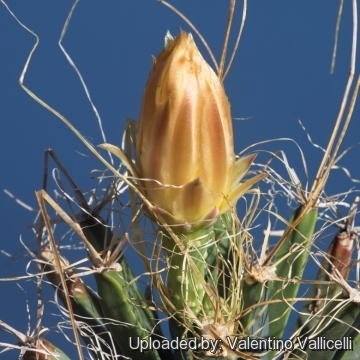 Although occurring over a rather large area, these cacti are sparsely scattered and can be difficult to localize. This species is uncommon. The population size is estimated to be more than 500,000 individuals. Altitude range: It is found from 1,500 to 2,000 metres above sea level. Habitat and Ecology: This species is found in semi desert on calcareous soil. 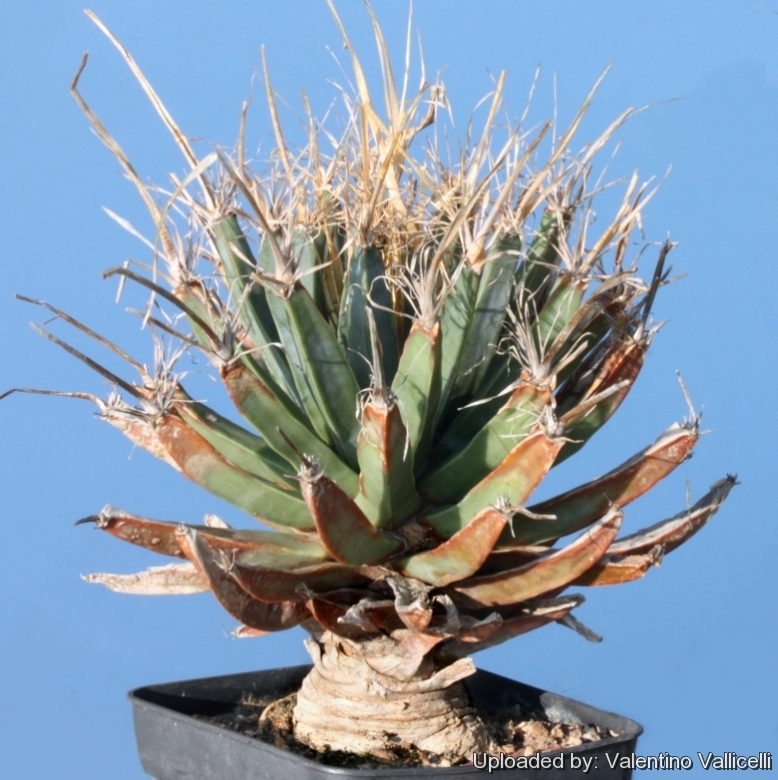 Usually the plants occur singly, often growing in clumps of Agave or Hechtia. This species is threatened by illegal collection and cattle and goat grazing in its habitat. This species is legally protected in Mexico under the national list of species at risk of extinction, NOM-059-SEMARNAT-2010, where it is listed as “threatened” (A; SEMARNAT 2010). Leuchtenbergia principis f. cristata hort. Leuchtenbergia principis f. monstruosa hort. Leuchtenbergia principis f. gracilis hort. 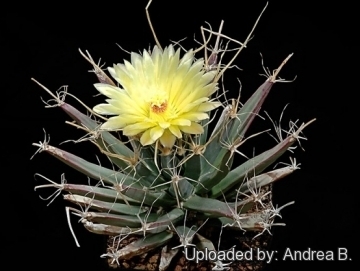 Description: Leuchtenbergia principis is the sole species of the genus Leuchtenbergia, it is a unique looking cactus with very long tubercles, making the plant resemble an agave. It is slow-growing but can eventually grow up to 70 cm high. 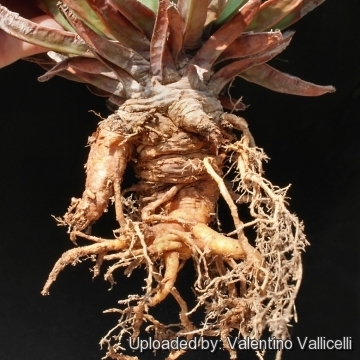 Root: It has a large, tuberous taproot. Stem: Solitary or slowly offsetting, cylindrical which becomes bare and corky at the base with age, forming a 7.5 cm thick trunk. Tubercles: Long, slender, grayish-green to bluish-green, triangular in cross-section, resembling triangular agave-like leaves with the tips cut off, 6-15 cm long, with purplish-red blotches at their tips. Old, basal tubercles dry up and fall off. Areole: At the tip of the tubercle with grey wool. Spines: The tubercles are topped with papery, flexible spines; central spines 1-2, up to 20 (or more)cm long; radials 8 to 14, up to 5(-10) cm long. 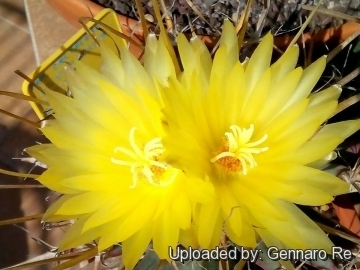 Flowers: From the areole at the tip of the new tubercles on mature plant (at least 4-5 years old)large, funnel-shaped, fragrant, yellow, 5-10 cm wide. Fruit: Green to violet, 3 cm long and 2 cm broad, more or less glaucous, smooth. 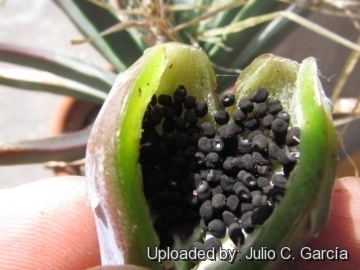 When ripe the bottom of the fruit open and release several hundred large seeds. Blooming season: Leuchtenbergia (like the Astrophytums) flowers intermittently throughout the warm months from spring to autumn. Leuchtenbergia principis Hook. : It has long, slender, bluish-green triangular tubercles 6-15 cm long, tipped by equally long papery spines making the plant resemble an agave. It has a large, tuberous taproot. 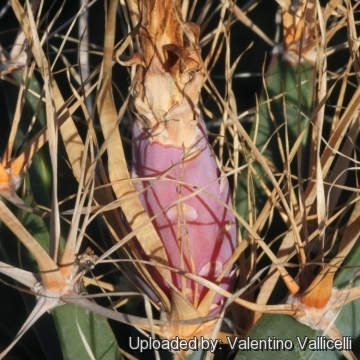 Older plant forms a short cylindrical shaped stem. It is unlike anything else. Leuchtenbergia principis f. cristata hort. : Crested form. Leuchtenbergia principis f. monstruosa hort. : This is an heavy clumping (monstrous) cultivar, with small and densely branched heads at the tip of each tubercle. Leuchtenbergia principis tariapensis: This is a smaller form with very thin and long tubrecles. 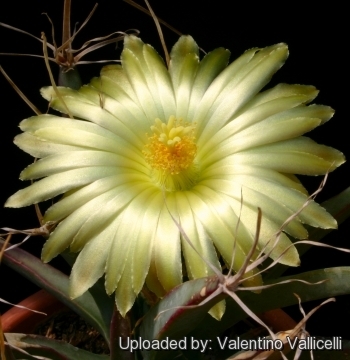 Leuchtenbergia principis var. trachythele: The "trachythele" variety is reported to be distinguished from standard "Leuchtembergia principis" by its rough, sandpaper-like epidermis. 5) Fitz Maurice, B & Fitz Maurice, W.A. 2013. Leuchtenbergia principis. The IUCN Red List of Threatened Species. Version 2014.2. <www.iucnredlist.org>. Downloaded on 10 September 2014. Anhalonium leuchtenbergii (Leuchtenbergia principis) Photo by: Andrea B.
Cultivation and Propagation: It grow easily from seed in cultivation. Despite being revered by many collectors, they are not too difficult. The plants on their own roots need deep pots to accommodate the strong napiform unit formed by the stem base and the rootstock, and a loose mineral soil with a well-drained substrate. They need a good amount of light, a place near the roof of the greenhouse helps drying the pot after watering. This can be done weekly during summertime, if the weather is sunny enough, with a little fertilizer added, lack of water will make the tip of the tubercles yellow. Too much water will make it rot. Kept this way, plants will show a healthy, although slow growth. Grafted specimens must be cultivated according to the needs of the grafting stock. Frost Tolerance: Light frost protection required for safe cultivation, but can tolerate sporadic brief periods to -8 degrees. Propagation: Usually by seeds, but it is possible to make tubercles cuttings that roots erratically.